I took Happy Meal to LegoLand for the weekend, and after a day at the 2nd happiest place on Earth, it was time to get some snacks. I asked the waitress if she preferred the chicken-fried steak or the burger, and she suggested the latter. 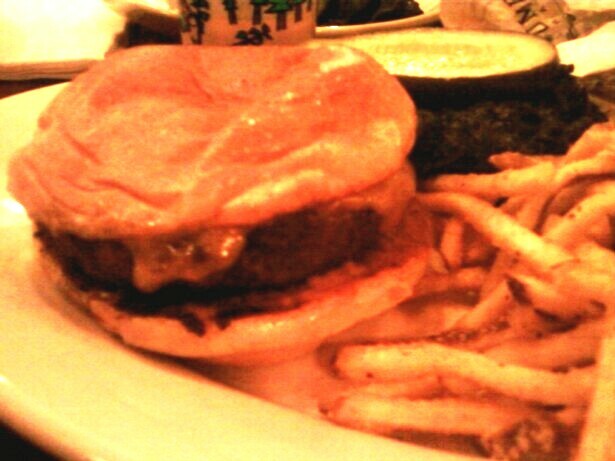 1/2 pound burger--no wonder The Biggest Loser is so well loved. In good conscience I must advise you not to eat the whole thing. I didn't--I wanted to live for a couple of more years. Since it was a half pound, I ordered it Med, so that the middle would come out right. I also wanted some of that fat to render out. Grilled not griddled, so the sear was spotty. The buttered the hell out of the toasted bun, so if you visit, you should go ahead and apologize to your heart on the way in. The ground Chuck was not aged, so that front note of funk was lacking. It was an 80/20 blend at best with a medium grind. That bun was nice and squishy, so it had a good mouth feel--it wasn't overly sweet, so it didn't compete with the light touch on the seasonings on the burger meat itself. The cheese was a flavorful Tillamook Cheddar. They seasoned the exterior, so it had that element working for it. The beef was pretty oily, so I fell in love with my napkin all over again. It was a pretty OK burger, and since Five Guys was an hour away.......it was the burger that we had to work with. Burger Review : Not bad--not great, but not bad.